The 5th Annual Fest de Marionettes aux Estampes. In July myself, along with five other puppeteers working under the London School of Puppetry banner, attended the fifth annual "Fest de Marionettes aux Estampes". A puppetry festival in the south of France created by LSP student Deborah Maurice. This was honestly one of the most amazing experiences I have had, and one I will not soon forget! It is hard to believe how much time has passed since we were at Deborah's beautiful farm house in Le Poet Laval, but for the two weeks we were there... it was home, and our quirky, wonderful group of puppeteers were family. 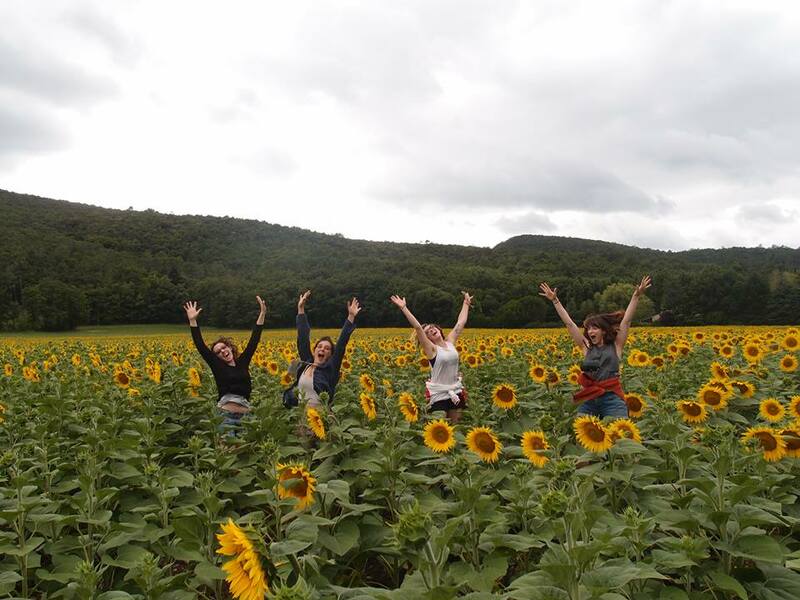 In the lead up to the three day festival we spent our days rehearsing our shows and building our installations, or where we could manage, taking a dip in the pool or frolicking in the sunflower fields. The evenings were spent drinking wine, eating cake and often playing scrabble! Though these two weeks were a lot of hard work, looking back, I only really remember how much fun we had a midst the chaos. Puppeteers may just be the silliest people on this planet, and oh how I love it. A wonderful environment, spending all of our time surrounded by other puppeteers and performers, everyone was completely comfortable to let their silly shine. Our LSP troupe had brought with us, our installations developed in England under the guidance of Emma Fisher (see Installation Workshop with Emma Fisher), some short table top performances (see Henri's Journey) and also two glove show's based on A Midsummer Night's Dream. On top of all this, we were also running a series of puppetry workshops for the local community... It is safe to say, we had our work cut out for us. Looking at our installations, it was amazing how much they grew from the environment around them (Emma did tell us this would happen). Housed through Deborah's dark cellar spaces and in her beautiful garden, our installations began to really take shape with the influence of the French farm. My own installation, inspired by folk festivals and in particular dream catchers and worry dolls; in Grassington had been confined to the small front courtyard, but here had the opportunity to expand in a larger outdoor space. My dream catchers filled a large tree and the bags of worry dolls extended down the pathway leading in to the cellars for the other installations. My marionette Astrid took over the role of the worry doll leader, as in this large space with an audience of sixty or more, my tiny worry doll puppet would have been invisible... unlike her debut in the LSP courtyard with an audience of two! Everyone's installations were wonderful and the experience as a whole was incredibly well received by our audiences. A living installation, the audience would move through the spaces discovering what each puppeteer had in store for them. We performed the installation four or five times over the course of the festival and the feedback we received was fantastic. I had never really considered installation as something I could do, but I really enjoyed the process through conception, creation and performance. Many a worry doll did go missing throughout the festival, but in classic Jhess style, I managed to find the silver lining... If these little dolls have gone home with someone, perhaps they have escaped their sad fate as worry dolls, and if that person gets something positive out of my strange little creation, all the better. Plus, it prompted an amazing worry doll working bee! About seven of us sitting around a table, an awesome production line making hundreds of dolls for the remainder of the festival! Now on to our table top shows: We had been asked to create short three minute pieces that could be performed at the dinner table. On the first night of the festival there was to be a Dinner Spectacular at which we would be performing our pieces, rotating around eight long dinner tables set out in the garden. It was a beautiful atmosphere in which to perform and a really wonderful idea (one I would love to attempt again in future). Myself and my Henri Orangutan made our way around the tables; Henri interacting with the guests and performing his little show, while around us the LSP team circulated to the delight of the audience. The atmosphere on this evening was amazing, there was a real feeling of camaraderie between the performers and also with the audience. We were all sharing something really special together and the buzz around the space was of energy and enjoyment. All of our little shows were received well, from the fun and silly like my own to the sad and moving like my friend Alice Ramage with her beautiful scarred lady. Our tabletop shows did make appearances throughout the rest of the festival, most famously on the third day when the rain decided to bucket down, we invited a small audience of about 6 in to the artist's quarters and did a private show for them with our puppets. This brings me to our Shakespeare shows: Myself and fellow LSP student Ella Mackay had each developed a short five minute glove show inspired by Shakespeare's A Midsummer Night's Dream. Given the nature of the work; inspired by the same play, working in the same discipline, it was really amazing to see how different our pieces were. Two very different performers, we did a lot of work together in the lead up to the festival, rehearsing and developing our shows. My own was based on the four lovers and was performed in a very slapstick manner with an umbrella as my set/ costume. Ella's on the other hand was based on Puck and Oberon and had a lot of focus on Ella's amazingly expressive hands! Ella originally performed her show on the ground with a large boot offering some sense of deformity for Oberon and a set for Puck. This version was incredibly well received in England at LSP's showcase event (see Living Room Theatre), however here in France, Ella had other ideas. She had stumbled across a beautiful old tree, with a hollow nook at the top, just the right size for a small puppeteer. With the support of everyone at the Festival, Ella was able to perform her show in the tree, and it was absolutely magical... audiences raved about the show and many came back to see it multiple times. I was incredibly proud of Ella for her work. My own show unfortunately did not work as well; "Topsy Turvy" employs some visual trickery in that my own body/ face serves as two characters and therefore the audience needs to view the show from a particular angle for it to be effective. At LSP's showcase event in England, it worked very well with a small audience of around eight viewing it front on. In France we attempted it as an outdoor piece and the audience inevitably would spread around me in a semi circle, causing me to lose my point of focus and the piece to lose its clarity. This is not to say that the audience did not enjoy my show, it just gave me some more insight in to considerations I would make for any future performances. See Gallery for images of "Topsy Turvy". Finally I will touch on our workshops: Facilitated by Sydney puppeteer and LSP graduate, Kay Yasugi, we explored the world of paper and how a puppet can come to life from the simplest materials. We looked at the material on its own; how does it sound? How does it move? What shapes can it create? I have done some work with paper in the past with Melbourne's Gary Friedman, but it was really exciting to rediscover this medium in an environment of play. We also did some work with multiple puppeteers operating paper men, in a performance style akin to Japanese Bunraku. We had the opportunity to work with some really wonderful people throughout these workshops; three performers from Belgium, volunteers at the festival who we had come to love, brought us the concept of wind to play with. Based on a show they were developing, we played with the idea of wind with our paper men and created some really interesting work together. I really enjoyed being involved in these workshops and feel I learned a lot. It was a nice reminder to look at simple materials and find inspiration through play. We showcased some of our work to audiences on the final day of the festival and encouraged them to create their own paper puppets; this was another wonderful shared experience, an atmosphere of energy and creativity. I can not express how much I enjoyed my time at the Fest de Marionettes aux Estampes. To my wonderful colleagues Ella Mackay, Addya Panayiotou, Kay Yasugi, Alice Ramage and Caroline Astell-Burt, thank you for everything. You all know how dear you are to me. Thank you to all the other artists and volunteers and of course to our festival organizer, Deborah Maurice. Thank you all for a wonderful festival. Hopefully I will be back for another soon! There is so much more I would like to write about this festival, but it would be a novel! I wish I had kept a journal throughout to document each wonderful day... The hilarity of the shadow monkeys. Operating the giant puppets with the Belgians. Alice and Addya's beautiful yellow costumes. Children chasing Astrid. Henri ordering beers. Kay's and my bedtime antics. The day Ella and I climbed the mountain! !